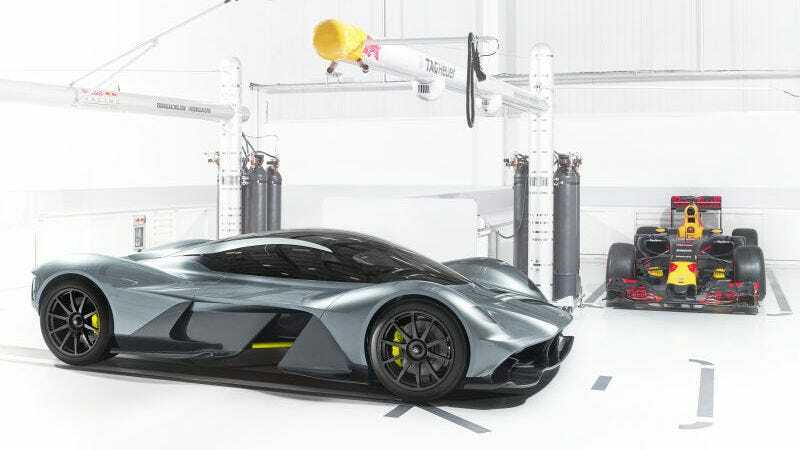 We’ve known the 2019 Aston Martin Valkyrie hypercar was going to be an insane car for almost a year now, but the extent of the insanity was only known to those with the job titles or bank accounts to get close enough to it. But if this latest report is accurate, the Valkyrie will be properly insane. The latest reported specs of the Valkyrie are incredible; allegedly it’s a 1,130 horsepower pod weighing just 2,270 pounds and, shockingly, with enough storage space for two people over a weekend, according to Road&Track. Oh, and then there will be a track-only version. What’s even more impressive is that Aston Martin is confident it will be street-legal everywhere it sells, including in the U.S., despite reportedly ditching wing mirrors for a camera system in the name of weight-saving. The car is reported to get about 1,000 horsepower from its high-revving 6.5-liter naturally aspirated V12 engine, and the remaining 100-or-so horses from a KERS setup linked with an electric motor. The racing version is also reportedly lower than the street-legal car, possibly with a removable steering wheel so it’s a little more dignified getting in and out of the car. A prototype is reported to be ready sometime next year, in time to run a lap of Le Mans, and customers can expect their completely customized car in 2019. It sounds gloriously insane.